Summer is a wonderful time to showcase the fresh, vibrant flavors of ingredients like salmon, fruits and vegetables. This recipe uses simple, sweet and savory products to do exactly that. 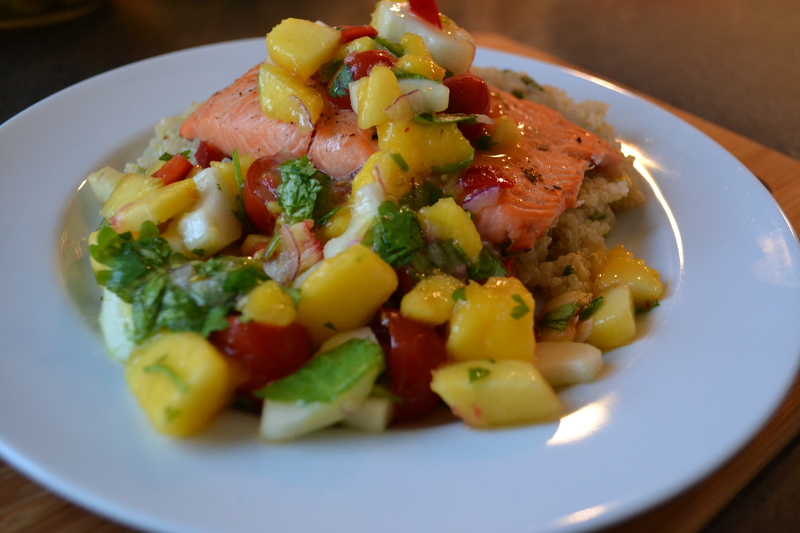 Salmon, quinoa and fruit-salsa makes for a hearty, healthy and photogenic meal! While the salmon and quinoa both lend their own gravitas to the final dish, it’s no secret that the colorful and lively salsa is the star here. The fresh peach and mango may be sweet, but their natural flavors don’t overshadow the smooth, cool crunch of the cucumber, or the herbaceous pop of cilantro. The jalapenos, from which I carefully removed the seeds, added a pleasant spicy zip, but the lime was – ultimately – the star of the show, as it complemented the natural acids of the other fruit, works well (as always) with the fresh fish and cilantro, and married together the rest of the ingredients. Fluff the cilantro and lime juice into the grains. Prepare the salmon by patting it dry, and seasoning with a pinch of salt and pepper. Brush the grill grates with oil, or coat with grill spray. 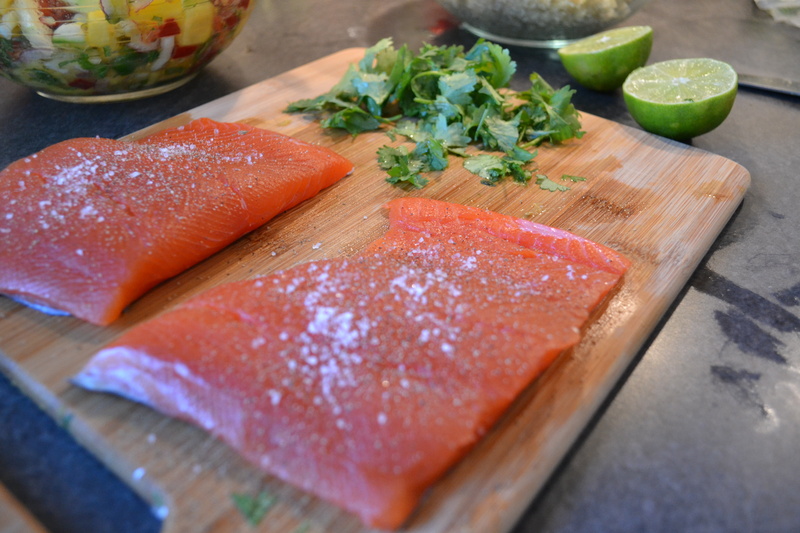 Grill the salmon – skin side down – over medium-high heat for 6-7 minutes. 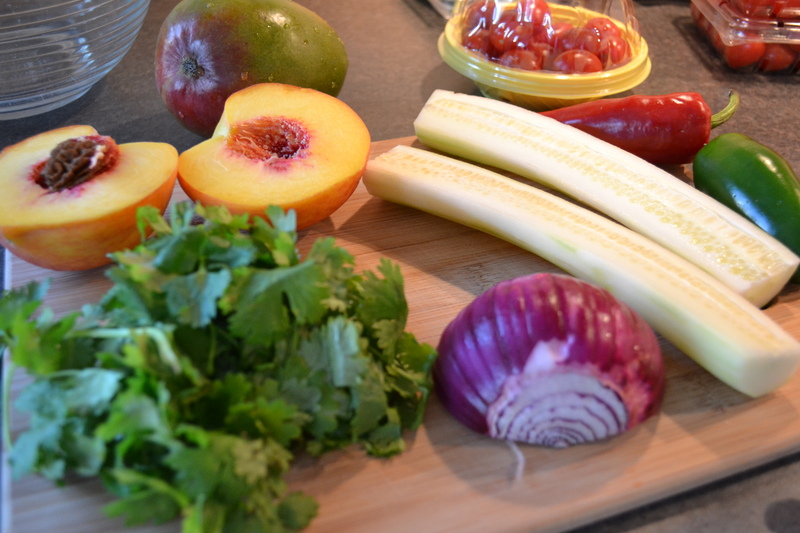 Meanwhile, prepare and combine the salsa ingredients. Make sure to season and add citrus to suit your taste. Serve the salmon fillets over a bed of quinoa, and with a generous serving of the fruit salsa, and (of course) enjoy! This looks colorful healthy amd dicious, i ve got to try it ! It’s soooo good! Try it out, and let me know how it goes! Love salmon! And what a great addition to it -such salsa!